What better way to get YOU ready for the hockey season, than through the fun and freedom of summer camp? Enjoy this hockey training inspired weekend away amongst the lake, the crisp northern air and natural wooded surroundings of camp. It's the perfect combination of on-ice hockey programming and fun camp activities. Our goal is to get you ready for your hockey season while at the same time making sure you reconnect with your love of the outdoors and your camp spirit. 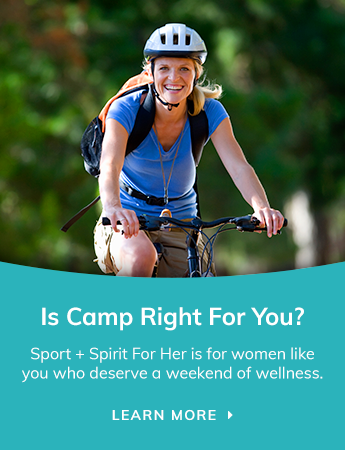 You'll have a chance to meet, mingle and be "sporty" with women from all over Ontario – women just like you who love the sport of hockey but also want the opportunity to get away for a few days, breathe in the fresh air of northern life and enjoy an active weekend. The retreat will be limited to 44 participants, with small hockey teams (10 players + 1 goalie) and camp activity classes sizes, offering you your own intimate hockey and camp experience. Women, 30+* years of age (*age restriction can be reviewed on case by case basis). We have designed a well-rounded, robust schedule combining hockey training, fun and fitness.Our one-ice hockey program includes 2 (1.25 hour) of Skills & Drills plus 2 (1 hr) scrimmage games. All focused on skill development and friendly competition. We also offer you the flexibility to opt-in and participate in the camp activities of your choice. Our qualified and experienced instructors will take you through 2 Skills and Drills sessions (1.25 hr each) to refine your individual abilities and knowledge of the game before competing in two competitive scrimmage games (1 hr each). Teams will be evenly drafted to ensure friendly competition. We've selected our keynote speaker carefully to ensure they inspire guests beyond the weekend. We offer guests a choice of both land and water activities that will make sure to add the fun summer camp experience and 'spirit' to your weekend. Plus you will be able to choose some rejuvenating yoga sessions for your added relaxation. Enjoy!